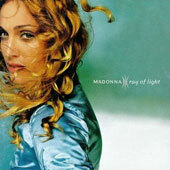 Produced with William Orbit, 1998's "Ray Of Light" was a watershed album for Madonna. The March release debuted at No. 2 in the U.S. (stuck behind the "Titanic" soundtrack) and at No. 1 around the world. It garnered six Grammy nominations (including album and record of the year) and nine MTV Video Music Award nods. Madonna took home the best pop album, dance recording and short form music video Grammy awards. The album's art director, Kevin Reagan also took home a trophy for best recording package. Madonna also picked up six MTV Video Music Awards, including Best Female Video and Best Video of the Year (both for Ray Of Light"). The set was a spectacular success chart-wise, with five international hit singles. "Frozen" climbed to No. 2 in the U.S. and became her first U.K. No. 1 in eight years. The title track debuted at No. 5 on the Hot 100 in the U.S. (her highest debut ever) and went to No. 2 in the U.K. Three more U.K. top tens followed: "Drowned World/Substitute For Love" (No. 10), "The Power Of Good-bye" (No. 6) and "Nothing Really Matters" (No. 7). The latter two reached Nos. 11 and 93 in the U.S., respectively. "Ray Of Light" has sold over four million units in the U.S., and another 10 million outside America.